Emily Smith, ’19, looks to make a move against DePauw University guard Blair Carlin. 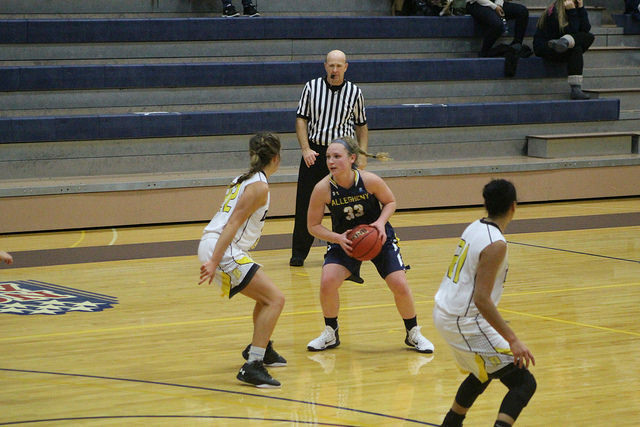 The women’s basketball team started off conference play on Friday, Dec. 2, and Saturday, Dec. 3, with back-to-back losses to Wittenberg University and DePauw University. Forward Olivia Barkley, ’19, said the team did well adapting defensive strategies, changing up offensive plans and adjusting to what was not going well. 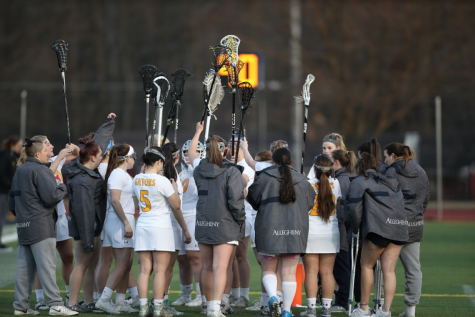 Head Coach Kate Costanzo said the team did a better job of moving the ball and had more assists over the weekend than in previous games, and learned how to change defensive plans to compete better against conference teams. Guard Delaney Arbore, ’19, said the team is working through several team members being out with injuries currently and learning how to work together after losing a large group of senior leaders last year. “I think a lot of people are starting to step up into leadership roles. … I think we improved on our overall flow on offense, and that’s something we’ve been working on for a while,” Arbore said. Arbore scored a season-high of 23 points for the Gators against Wittenberg. Arbore said a challenge the team faced throughout the weekend was help defense, a part of defense that provides the most comprehensive coverage of all players and areas of the court. “We would either help too much or too little and that gave the other team a lot of scoring opportunities,” Arbore said. Barkley said the team faced pressure going into the weekend since it was the first conference games of the season, but the weekend showed the team what it is capable of in competition. “DePauw is one of the best teams we’re going to face this season so getting to see such skilled and experienced players is different for us, and I think it’ll help us going into the rest of the season knowing what to expect and what to improve on,” Barkley said. Barkley said the team had five seniors last season who took charge on the court, and this season they have one senior who is out with an injury. “It’s a lot of underclassmen stepping into a leadership role and [learning] that we need to be more vocal. We need to mesh better as a team versus having a ton of upperclassmen leading us and telling us what to do,” Barkley said. Costanzo said her goal for the team is to continue improving with every practice and game. The women face Hiram College on Saturday, Dec. 10, at 1 p.m. at home in the David V. Wise Center.